The day before Thanksgiving will be the pre-holiday ritual of long lines, frustration -- and National Opt-Out Day, a movement calling on alrline passengers to forego the controversial new body scanning machines in favor of manual security pat-downs. The Transportation Security Administration (TSA) says it can fine individuals up to $11,000 for walking away from the airport security process. But will it? People in government say the fine is mostly a deterrent so that terrorists cannot back out of a security check once it starts. The TSA said it has yet to fine a traveler for not completing the screening process, though it has levied civil penalties against passengers who have brought dangerous items to the security checkpoint. "While TSA has the legal authority to levy a civil penalty of up to $11,000 for individuals who choose not to complete the screening process, each case is determined on the individual circumstances of the situation," said Greg Soule, a spokesperson for the Transportation Security Administration. Congress transferred the enforcement of civil aviation security to the TSA from the Federal Aviation Administration in November 2001, after the September 11 attacks. 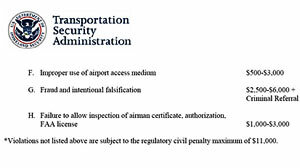 The TSA's current civil penalty monetary guidelines, which became effective on August 20 last year, say the security administration can impose "civil monetary penalties…up to $10,000 per violation for surface transportation modes [for breaches of highway, pipeline, freight rail and mass transit security policies] and up to $11,000 per violation for all other persons…"
The TSA said it is not common for passengers to refuse airport security procedures and walk away instead of boarding a flight, the way John Tyner did at the San Diego International Airport on November 13. Tyner, of Oceanside, Calif., refused to enter the body scanner at the security checkpoint and told a TSA agent, "If you touch my junk, I'll have you arrested." A TSA official warned Tyner, a software engineer, that he would have to pay $11,000 for walking away from a security procedure that was in progress. Tyner told ABCNews.com that he has not had contact with the TSA since the confrontation. After traveling the media circuit and blogging about his experience, Tyner said he has received an outpouring of public support. Airport Pat-Downs: Will the TSA Fine You? Tyner's viral audio recording on YouTube added impetus to National Opt-Out Day, which was an unrelated movement he did not organize. TSA officials warn that choosing to participate in National Opt-Out Day could not only cause delays on one of the busiest travel days of the year, but could also lead to fines if passengers walk out on the security process. "On the eve of a major national holiday and less than one year after al Qaeda's failed attack last Christmas Day, it is irresponsible for a group to suggest travelers opt out of the very screening that could prevent an attack using non-metallic explosives," said TSA Administrator John Pistole. Privacy advocates disagree and say body scanners infringe on the personal boundaries. In July, the Electronic Privacy Information Center sued in a federal appeals court to suspend installation of the full-body imaging machines. Some security experts question the effectiveness of the machines and pat-downs. Isaac Yeffet, former head of security for the Israeli airline El Al, said the machines are not worth the hundreds of thousands of dollars to taxpayers, and the $11,000 fines will not deter terrorists from completing the security process. "It's ridiculous. A $100 fine or $11,000 fine is inefficient," said Yeffet, who runs his own security consulting firm, Yeffet Security Consultants. Yeffet said mandatory one-on-one questioning was the key factor for the successful record of El Al. He said an interview system is also scalable for the larger airlines in the United States. The TSA has continued to defend its practices. "After coming to TSA with 26 years of law enforcement experience at the FBI, I understand the serious threats our nation faces and the security measures we must implement to thwart potential attacks," said TSA's Pistole in a statement. "This technology is not only safe, it's vital to aviation security and a critical measure to thwart potential terrorist attacks." Yeffet pointed to the failed underwear bomber's attempt last Christmas as an example of the failure of technology and the futility of a reactive, not proactive, airport security system. "Why punish all passengers and abuse the rights of the people? If there is someone who is suspicious, search that person," said Yeffet. "The best technology in the world cannot replace a qualified and well trained human being." Airport Pat-Downs: A Fine for Saying No?